The long, hot days of July have produced ideal conditions for wildfires this Summer and, it is true, that Montana has been affected by some substantial fires. Fortunately, Glacier National Park has not experienced the devastation experienced in some areas so far but we are not unfamiliar with large scale forest fires and the impact they can have on a community. Wildfires are a natural phenomena, often caused by dry lightning strikes. They can be helpful in maintaining a healthy forest environment. For example, fire enables the regeneration of a forest floor that has become overgrown with fast-growing shrubs and trees that have blocked the light to seedlings below. Fire also disinfects as it travels – destroying any plant diseases and insect infestation. Its natural effects on the eco-system are one reason why the National Park Service in Glacier National Park prefer not to manage naturally started wildfires, unless they begin to threaten property or life. It is also true that many fires are needlessly caused by human action, whether deliberate acts or arson or accidental means. 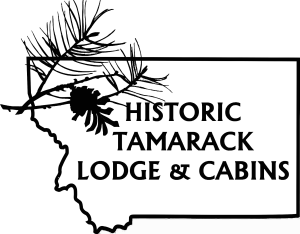 It is here where we can help support our environment at the Historic Tamarack Lodge and Cabins. In our area, Stage 2 Fire_Restrictions are currently being enforced and, as a result, there are no campfires, BBQ grills or smoking currently permitted on property. We know our guests, as visitors here to appreciate the natural beauty of the area, will honor the restrictions and continue to enjoy their vacations, including the particular aspects unique to wildfire season. After all, wildfire is a part of the wilderness area in which we live and is to be respected and appreciated as is any other element of nature. Enjoy the views! Sunsets and sunrises, in particular, can be unworldly at this time and provide outstanding and unique photography opportunities. At other times, you may notice the silhouettes of hillsides that may not otherwise have been noticed, or hazy mountain tops that look like an artist painted them into the background. Learn how planting affects the health of a forest and can mitigate against fire by visiting Coram Experimental Forest. Discover how our hotshot crews manage fires. Watch our #montanastrong community spirit in action (eg hay donation, how you can help). Involve the littlest members of the family and design a coloring book, or write a story with Smokey the Bear. Visit the sites of recent fires in the Park, such as Virginia Falls (which burned in the Reynolds Creek fire of 2015), to see how quickly regeneration happens. 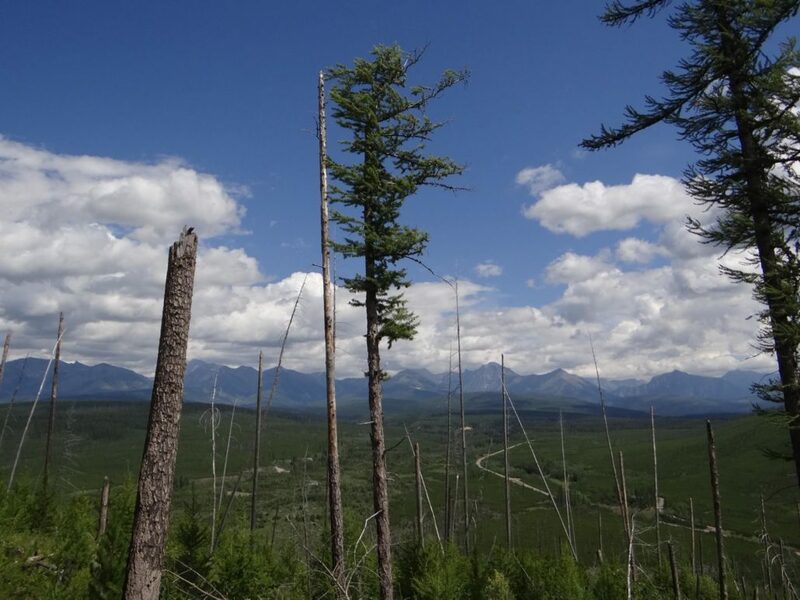 Drive the Camas Road to see how the Robert Fire of 2003 changed the scenery and opened up views of the peaks of Glacier National Park previously blocked by trees. Historically, visitors to Glacier National Park stayed in the great lodges that are still in existence today, and many present day visitors still choose to book lodging in these lodges to enjoy the history and beauty of the tradition they embody. However, the lodges book up quickly and, by keeping the original features that makes them valued as historic buildings come with few of the comforts and amenities of modern life. Our lodge was originally located right between the train station and the original entrance to the Park and served as an arrival hall for visitors disembarking from the train. The same logs you see today in the lodge have been privy to the hopes, dreams and plans for the Glacier National Park vacations of generations of visitors. Now located just eight miles away from the West entrance to Glacier, the lodge stays out of the congestion at the Park entrance whilst still offering lodging full of Park history. With the tag line ‘Classic ambiance, modern amenities’ we strive to preserve the history of our property and surrounding area whilst also providing the modern conveniences our guests expect. The lodge itself is heated and cooled with a geothermal system, leaving it at the ideal temperature all year-round. For extra comfort and that essential element of Winter in the mountains, the lodge also features a working fireplace in the original stone setting. Four rooms on the upper floor of the lodge – each with private bath and air conditioning provide cozy character with wifi and satellite tv. These rooms are built under the eaves with exposed beams and sloping ceilings. Two of our lodge rooms also share a covered balcony overlooking the front driveway. We also have a Saloon (serving locally produced beer, wine and spirits). a restaurant (serving breakfast and dinner) and a small gift shop and sleep approx 130 with an additional 26 cabins on site. Its the best Glacier National Park lodging – without a wait-list or the crowds!